Club car precedent 4 link HELP! 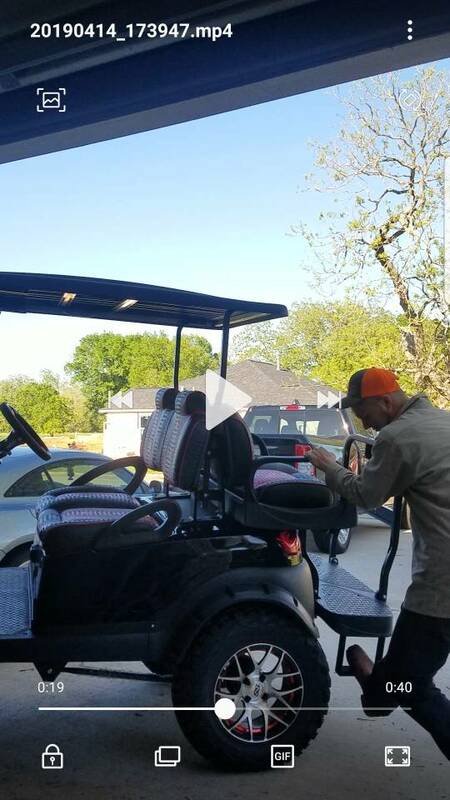 Re: Club car precedent 4 link HELP! Its installed but far from finished a few issues to work out. Shocks are causing some noise not sure how to fix it. The weight of the cart is not enough to compress the shocks. When you add a driver it barely compresses them. As you drive the shocks bang as they slightly compress and fully extend. A limiting strap would help but I feel this is only masking and underlying problem. As you turn the shocks compress pretty easily causing alot of body roll. I cant quite wrap my head around how a shock can be to stiff in one aspect yet to soft in another?! I think you need a panhard bar, something to locate the axle laterally. 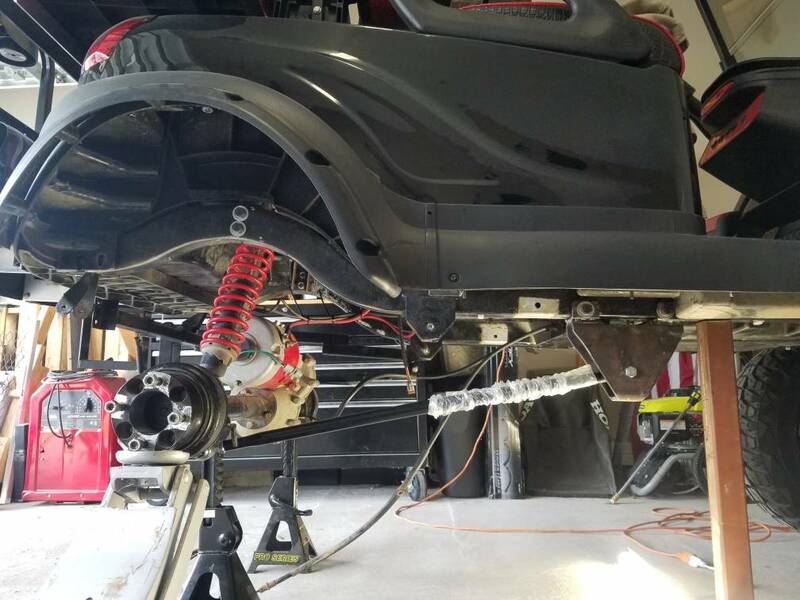 Take a look at this thread, some good info about trailing arm angle and axle wrap. 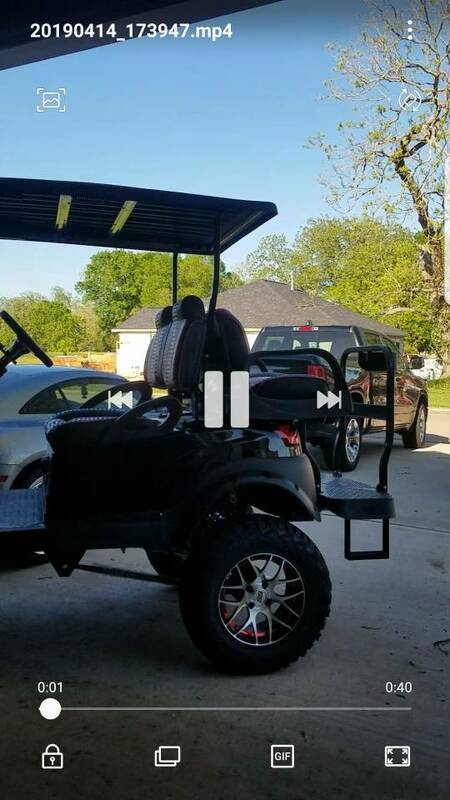 2 link rear suspension on EZGO?? Panhard bar isn't going to help with shock compression and body roll. Jkerle; have you tried changing the coilove setting to see if it helps improve the ride? Maybe take less of an angle off the shock to see if that helps at all? I dont think a pan hard bar will help in this situation I am thinking more along the lines of a roll bar as a last resort. I will be playing with the shock angle to see if it helps at all. I need to get a shock spanner to try adjusting the spring rate before making any other changes. I'm reading about shock preload now and I think this might be the cause. The cart needs to ride in the shock not on it. I'm thinking a fully adjustable coil over might be the only way to achieve the goal. I'll keep watching ebay and see if I can snag a set cheap. At this point I'm happy with the look of the setup as is. I'd really like to "make it work" if I have to spend some cash on shocks so be it. Those springs may just be too heavy for the weight of the cart. A dual rate spring could make a difference, but I think you need to figure out exact weight of the rear of the cart and calculate the spring rate you need. It looks like its sitting level in the pics, and that's no good if the shocks are fully extended. You need to have the shocks compressed something like 40% with the vehicle at ride height. That needs to be figured into your shock length, or the mounting locations for the shocks so the car sits properly with the shocks compressed at normal height. You may also end up needing a rear sway bar to control body roll when turning, but it depends how you plan to use the cart. Is it going to be a street machine or is it going off-road where you need articulation? Thanks everyone for your input!!! This makes alot of sense. If I build adjustable shock mounts for the axle end I'll be able to raise the shock up and lower the spring rate to get the ride height I want. I have a pretty good idea of what the cart weighs on the rear but how do you plan for the added weight of passengers and hauling sh!t? As it sits with the weight of the rear axle included it's at about 560lbs. The rear axle tires and motor are close to 200lbs. Would I divide the sprung weight of 360lbs by 2? This is where a dual rate spring also maybe called a progressive spring, comes into play. It will have a softer section that rides well with 1-2 people, but has a stiffer section that handles the extra weight when you have more people or cargo on. It will also help with body roll in corners if you have the suspension set up correctly. When the cart starts to lean it will lean just enough to get to the stiffer section of the spring. Determining spring rate gets a little more complicated than that, but I think you have the basics of it. That should be pretty close I would think. Try doing some google research. I'm pretty sure there are some calculators out on the web that can help narrow it down more. It is also important to consider how far the spring needs to be compressed when at normal ride height. The weight of the axle does matter, but mostly for proper shock valving to control shock compression and rebound. The coil-overs you bought were from a polaris? ATV or UTV? Determining spring rate gets a little more complicated than that, but I think you have the basics of it. That should be pretty close I would think. From what I'm reading the only way to go is with a dual rate unless I add a sway bar and that sounds overly complicated. Finding something for this width would be nearly impossible. Maybe from a micro sprint car or maybe an ATV if they make them? I went with the stiffest my thoughts being better to error on high end. The atv shocks are dirt cheap the utv shocks are extremely expensive even for OEM take offs.